Three demon hunters. Hundreds of demons. Let's go. Who is V? He saunters through Devil May Cry 5 with a sleeveless leather coat, a cane, and a book of poetry he can read in the middle of combat. Dante and Nero pulverise enemies with familiar melee combos, many unchanged from other games in the series. V lets his pet demons do the talking. The ranged fire button causes his pet bird Griffon to fire bolts of electricity at enemies. The melee button sends a shapeshifting panther called Shadow off to combo distant enemies. When an enemy is sufficiently battered, they reel back, turn a shade of grey and open themselves up to a teleporting finisher with V’s cane. The story switches between Nero, Dante, and V throughout Devil May Cry 5. V’s sections feel like a holiday. That’s partly down to V’s languid animations (he prefers to surf through levels on a pool of dark energy than run at full speed), but also thanks to his enormous pet golem Nightmare. When you activate V’s version of Devil Trigger the monster appears—sometimes via meteor, sometimes via a cavern in the ground—and starts automatically pummeling enemies with big fists and laser beams. With all your demons in a battle you’re pretty much guaranteed an SSS rank in any fight that lasts long enough for the points to rack up. Pressing back and your fire button triggers an area of effect electricity attack from your eagle that can juggle enemies and hold them in place for Shadow’s combos. Nightmare’s laser beams scour the ground and trigger explosions after a split second delay. Between all three you’re landing a huge number of hits on multiple enemies. If you wait for a few of them to enter the near-death state and chain your cane finishers, expect massive style points rewards. V’s unusual style breaks up Nero and Dante’s sections of the game nicely and, along with Nero’s disposable Devil Breaker arms, brings something new. Devil May Cry 5 could easily have been a nostalgic throwback to earlier games, but with a exceptional animations, a photorealistic look, and top notch performance capture, 5 takes Devil May Cry’s quirkiness and teen sense of cool and fits it into a package that feels like it belongs in 2019. The fan service is still there, of course. 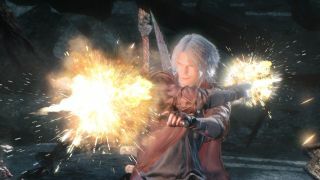 Dante can switch between his old melee weapons and guns on the fly, and he can use the D-pad to instantly switch between his classic combat styles Trickster, Swordmaster, Gunslinger and Royal Guard. After playing 11 missions, Nero feels like the main character of the three. He has more upgrade options and his eight Devil Breaker arms open up more room for experimentation. I wasn’t sure about them when I played the Gamescom demo last year, but in the final game the arms aren’t scattered everywhere like litter. You put together a sequence of four before you start a level and can refresh your loadout at Nico’s van. To master the game you will want to choose the right sequence of arms for a given level. You probably want the arm that gives you powerful midair moves to avoid the sweeping attacks of the first boss. Later, it’s easier to break through the guard of ghostly scissor-wielding enemies with a drill-like Devil Breaker. On the first playthrough you’re free to pick one or two you like and stick to them. It’s a flexible system that gives Nero a high skill ceiling for expert players. I hit a few issues during the demo. V's pet panther sometimes developed a mind of his own as I was asking him to target faraway enemies. I’d like more fighting and less talking from the first hour or so. While there are some very neat boss encounters, the first one feels like a bit of a mess, and a massive boss later that plods around in circles will likely end up being the low point of the game. The camera was much improved from my Gamescom experience, particularly indoors, though on two or three occasions it would tug away to follow an enemy I’d just slashed away and make the rest of the fight difficult to see. I miss some of the unusual enemy design we’ve seen from previous games too. You kill a lot of generic bugs in Devil May Cry 5’s first six hours. That’s all forgivable, and I could have happily kept playing beyond the 11 missions in that sitting. For seasoned players there are a lot of secrets to discover, including hidden red orb caches and secret missions that you unlock by aligning painted arcane symbols in the environment. For seasoned players these secrets will enrich repeat playthroughs. For new players there's an 'auto' mode that lets you trigger advanced combos with straightforward button presses. It's a nice feature for players who want to blow through the story, and it demonstrates some of the high level combos you can put together with Nero's Devil Breakers. The story isn't bad either. There's another demon invasion, and Dante and Nero are their usual cocky selves, but V is an ongoing mystery. Who, or what, is he? Why is he helping Nero and Dante? Is there more to his book than dodgy poetry? All will be revealed when the game comes out on March 8. Find out more about the game in our everything we know about Devil May Cry 5 roundup.